BEAVERTON, OREGON, March 27, 2018: Audio Precision announced today the addition of a new speech intelligibility measurement option for APx500 audio test software based upon the ABC-MRT speech processing algorithm. Measuring speech intelligibility is an important capability for engineers designing and validating a wide range of communication systems, products and components, especially those related to public safety (e.g., police, fire, emergency) where intelligibility is critically important. 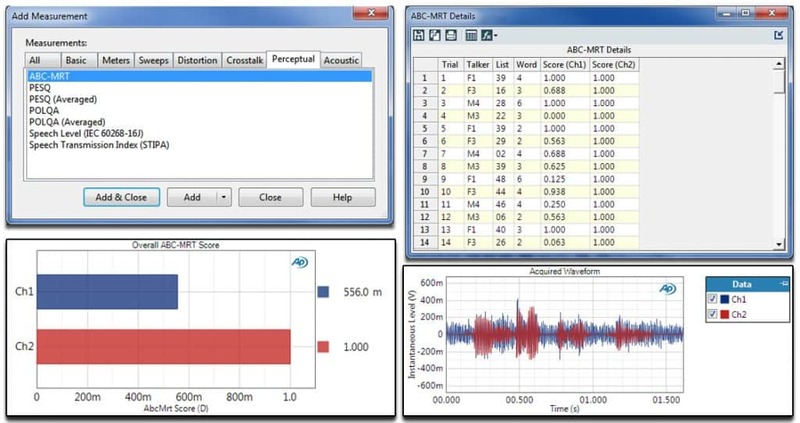 ABC-MRT measurement selection within the APx software’s perceptual audio menu, along with example measurement results. The Institute for Telecommunication Sciences (ITS) performs cutting-edge telecommunications research and engineering with both federal government and private sector partners. As its research and engineering laboratory, ITS supports NTIA by performing the research and engineering that enables the U.S. Government, national and international standards organizations, and many aspects of private industry to manage the radio spectrum and ensure that innovative, new technologies are recognized and effective. ITS also serves as a principal Federal resource for solving the telecommunications concerns of other Federal agencies, state and local Governments, private corporations and associations, and international organizations. For further information on ITS and ABC-MRT, visit https://www.its.bldrdoc.gov/. This entry was posted in News, Press Releases and tagged ABC-MRT, Modified Rhyme Test, MRT, speech intelligibility by Eric. Bookmark the permalink.